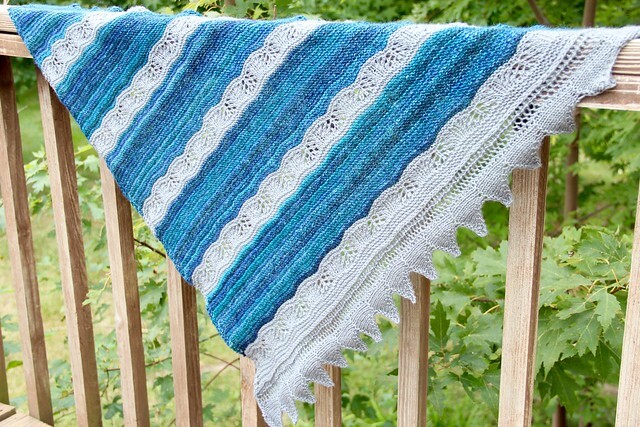 I am beyond excited today to announce the release of my first pattern design, Lost at Sea. 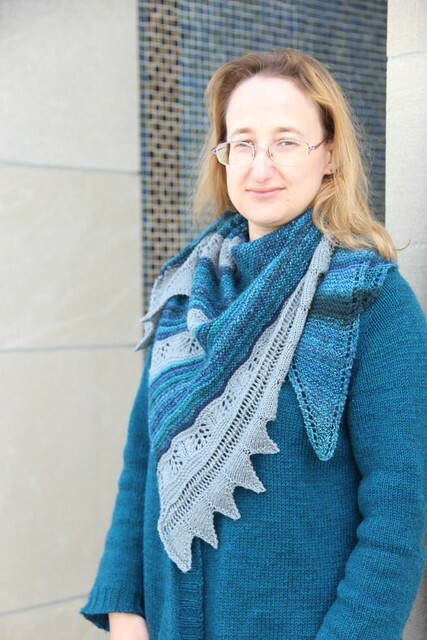 Lost at Sea is a 2-color shawl designed to be knit with handspun yarn. The shawl is knit on the bias with alternating sections of squishy garter stitch designed to show off variegated handspun yarns and a lace section designed to show off solid color handspun skeins. If you want to stretch a single precious skein of handspun, simply pair it with a complementary colored commercial yarn. Louet North America graciously offer to provide fiber support for this pattern. 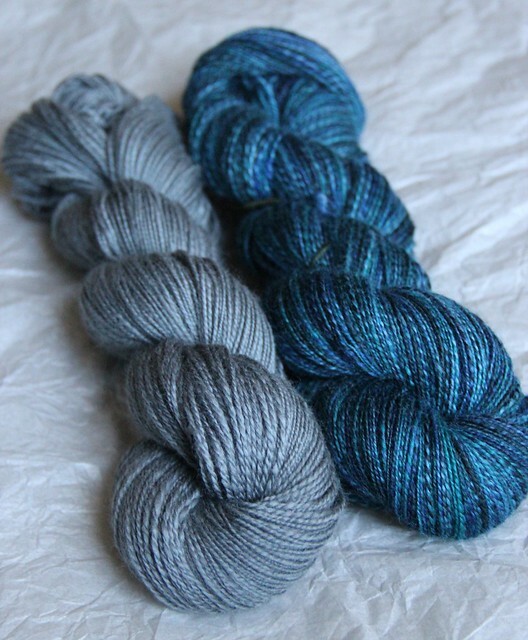 I spun some Louet Northern Lights Wool top in Ocean Waves and Louet Merino in Quoddy Bay Grey to knit the sample. A special thank you to Ana Reinert of the Well Appointed Desk for taking such wonderful photos. Lost at Sea is available as a free Ravelry download. Louet North America also graciously provided me with enough fiber to spin some up as a kit to give away to one lucky winner. You can enter the contest to win this kit on Ravelry, in The Corner of Knit & Tea group. 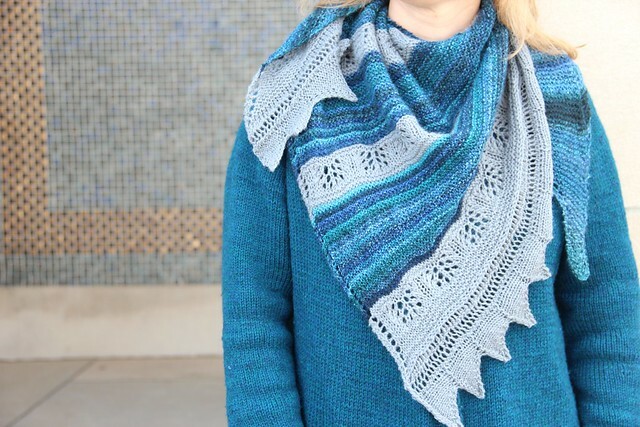 If you would like to spin and knit a shawl for yourself, Louet North America has put together kits with the fibers I used and a hard copy of the pattern. It’s super discounted and available here! I have also produced a short podcast about Lost at Sea. A special thank you to Stitchcraft Marketing and the folks at Louet who sent me fiber (retail: $63.00) for free. I received no other compensation for this pattern. All opinions and photos are my own, except where indicated.